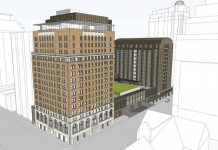 General Motors is preparing to build a seven-acre complex in downtown Toronto. 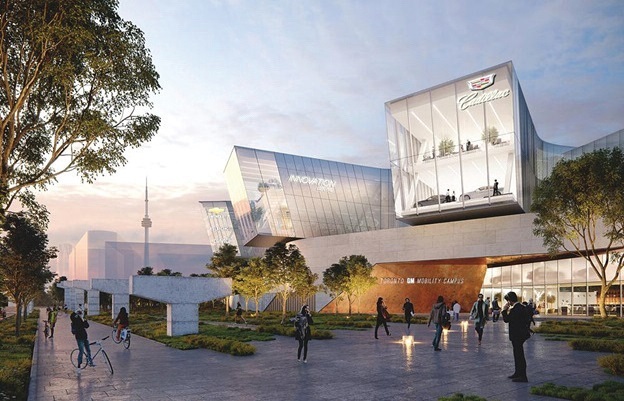 The development, called the Toronto GM Mobility Campus, will combine research and development facilities with vehicle sales. With frontage along Lakeshore Boulevard East, the south half of the seven-acre property will house a 160,000-sq.-ft. building comprised of a lower level podium that will rise to five storeys, with three wings offering panoramic views of Lake Ontario and downtown Toronto. The complex will include offices, R&D facilities for urban mobility, GM vehicle sales and service area, and a public experience area showcasing innovations in mobility, including electric and autonomous vehicles, e-bikes and car-sharing. According to CBC, demolition at the site will begin later this month, with construction expected to take two years. The project is designed by Quadrangle Architects.